Pleasure cruises and ferries on Lake Geneva in Switzerland are often not cheap but savings deals are available to make boat trips and tickets cheaper. 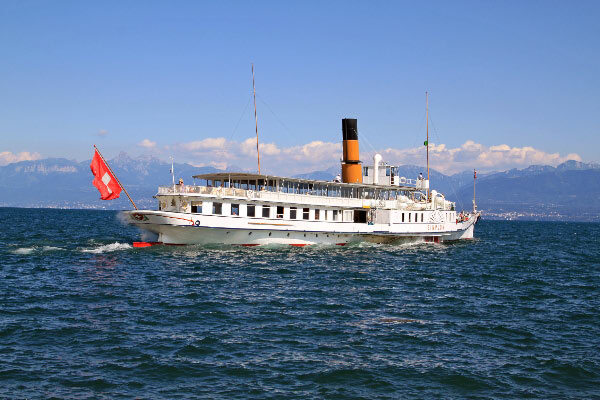 Day-trip pleasure cruises on Lake Geneva in Switzerland are very popular with many boats departing daily from major sights such as Genève, Lausanne, Montreux, Nyon, Evian, and Yvoire. These day-trip excursion cruises on Lac Léman are often fairly expensive but several special deals are available to bring prices down. All Swiss transportation passes are valid on Lake Geneva cruise boats while the Junior Card allows children to travel for free with parents. CGN pleasure boats cruising on Lake Geneva between Switzerland and France have first class and second class sections. Second class is often a false economy for tourists as second class passengers do not have access to the open-top decks that offer the best views of Lake Geneva, vineyards, and the Alps. Boat cruises on Lake Geneva between Switzerland and France are fairly expensive when paying full fares. For example, a one-way cruise from Geneva to Lausanne is CHF40 in second class, or CHF64 return. First class tickets on the same route are CHF54 or CHF90 return. Fortunately, it is seldom necessary to pay full price on Lake Geneva boat cruises. A variety of Family Passes are also available. The price depends on the number of adults and children traveling together. The Junior Card (Carte Junior) is one of the best savings offers for families living and traveling in Switzerland. It is available from the Swiss Railways at CHF30 per year per child. It allows children between 6 and 16 to travel for free on almost all trains, buses, cable cars, and boats as longs as they are accompanied by a parent with a valid ticket. Most Swiss children have a Junior Card and even for tourists the card can pay for itself within a single long journey. The Junior Card is available from any manned train station and issued on the spot. The Junior Card is valid for all regular boat cruises on Lake Geneva. Children traveling with their grandparents can buy a Grandchild Card, which offer the same benefits and also cost CHF30 and require travel with a grandparent. Children 6 to 16 without a Junior Card or traveling without their parents pay 50% of the regular fare. Children under 6 travel for free. Note that the advantages of the Junior Card can be included for free (then referred to as the Family Card) in the one-month Half-Fare Card that is only available to non-Swiss residents as well as in many other international Swiss transportation offers available to non-resident only. Note, the names of children must be added at the time of purchase, it cannot be added later on. CGN currently also offers a Kid’s Pass at CHF10 (CHF20 first class) for travel on week days. This allows for unlimited travel on Lake Geneva boats for the day, as long as the child (6 to 16 year) is accompanied by a fare-paying adult. All regular Swiss railway transportation passes and cards are also valid under the same conditions on CGN boats cruising on Lake Geneva. Thus bearers of the Half Fare Card pay only 50% and other passes such as the AG and Swiss Pass may cruise for free. The Half Fare card is great value to Swiss residents and many tourists may also find it value for money when used for longer trips. The Swiss Boat Pass gives 50% discount on most boats cruising on lakes in Switzerland including CGN boats on Lake Geneva. The Swiss Boat Pass cost CHF70 per year. Bearers of the Swiss Railways Half Fare card get the same discount automatically. Of better value is the Swiss Family Boat Pass. It cost CHF90 per year and gives 50% discount for parents while own children aged 6 to 16 cruise for free. The Junior Card and Half Fare card again may offer better value if other forms of public transportation are also used in Switzerland. Groups of 10 or more traveling together receive 20% discounts on individual prices and one free ticket. Bearers of the Half Fare Card as well as those under 25 years old pay only 50% of the discounted price. Return tickets for return cruises on the same day are slightly cheaper than two single tickets. However, many travelers prefer to return from long cruises by train, which is much faster. Most of the towns on the Swiss northern shore of Lake Geneva have very good railway connections – for example Nyon to Geneva by train is 15 minutes but an hour longer by lake boat. See also Lake Geneva Boat Cruises Departing from Lausanne, Nyon, or Yvoire in France.